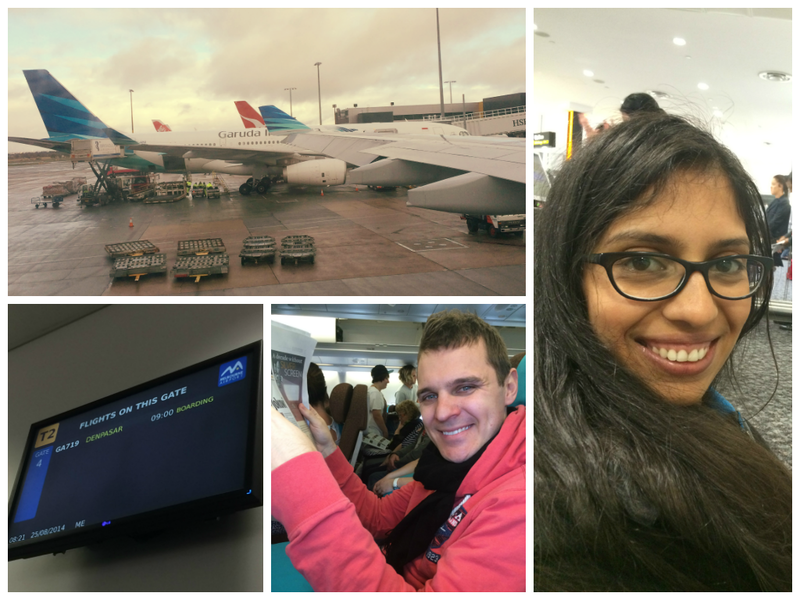 We went to Bali on 25 August 2014, returning to Melbourne in the early morning on Tuesday, 2 September 2014 (yes, Melbourne, not Auckland this time – our home for the last 6 years). After having gotten married earlier this year, we decided to postpone our honeymoon until we had moved to Melbourne and settled down a bit here. So, finally, time to take that trip. Our destination: Ubud, Bali. 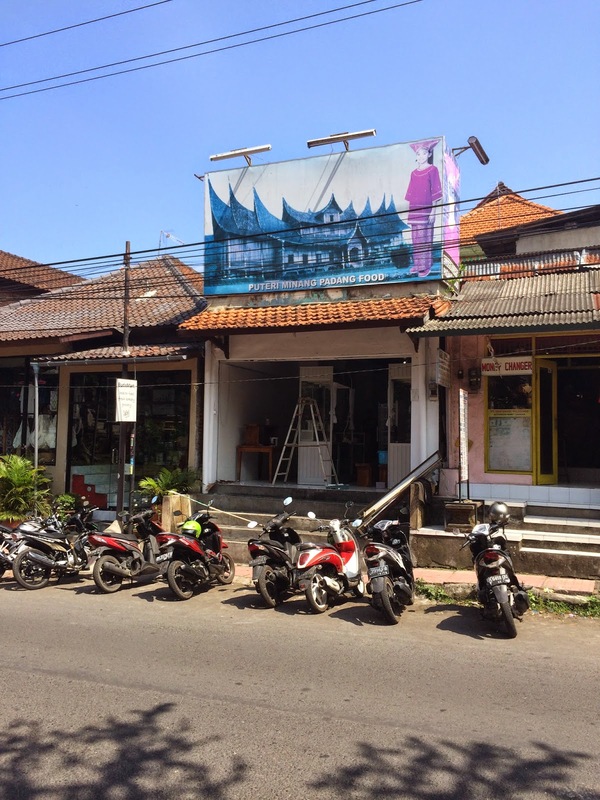 Here is what I had searched up and found about Ubud before going: Wikitravel, Lonely Planet. Ubud was described as the cultural centre of Bali; a tranquil getaway from the hustle and bustle of life. Having done some research, we expected it to be…well exactly what Wikitravel and Lonely Planet told us. What we did not expect, however, was that this small town would be packed with tourists from all over the world, and with tourist shops to cater for them over the entire town. Literally, kilometers of souvenir shops and yoga & meditation retreats. That little glitch aside, the trip was very enjoyable and adventurous. In those few days I think we walked for approximately 5 hours each day, through rice fields and villages alike 🙂 We got to meet some lovely local people, and visited the local night market (where there were almost zero tourists). We got lost, were guided in the right direction, and eventually always returned back to the hotel. Here are some pictures of our adventures. Oh but first, before I get on to the pictures, I must rant a little about one tiny aspect of this trip: Ubud is a small town in the central area of Bali. There are no beaches here, but many rice fields, ridges and valleys. There is nature. 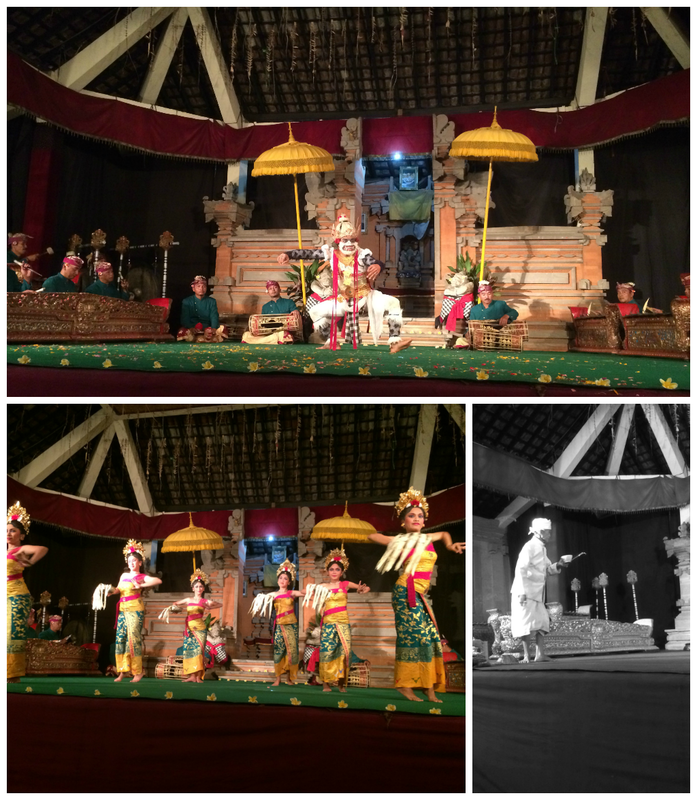 There is the traditional dance, the historical temples, music, art, but I did not understand what Ubud had to attracted so many tourists. There was no major or grand temple like one would find in Bangkok or a sprawling metropolis like Hong Kong or exuding the peace and tranquility of the mountains and hillsides of Japan. 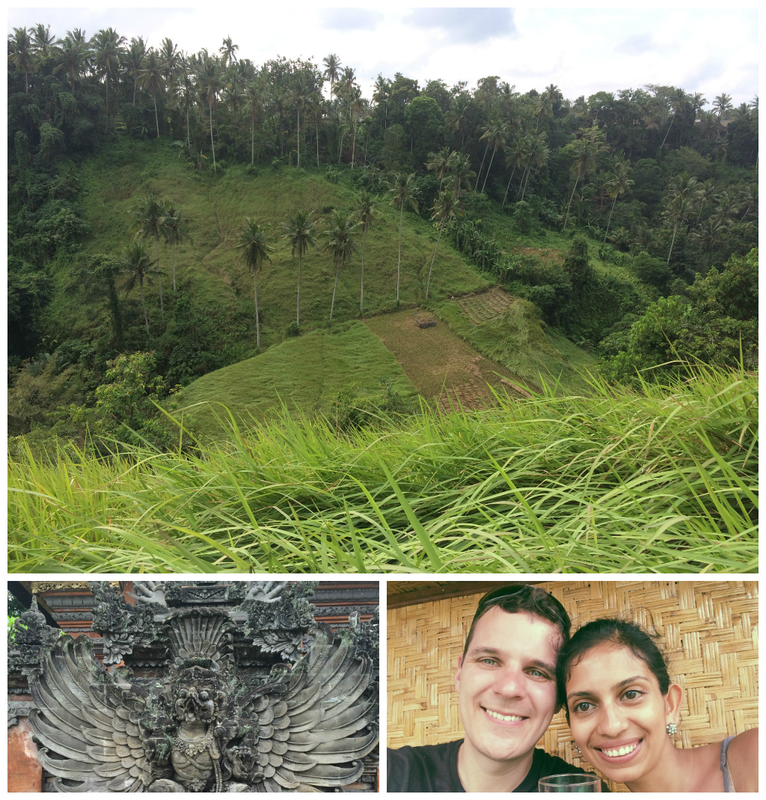 After exploring the town for a day or so, I came to the somewhat late discovery that Ubud was apparently featured as one of the places where the character in Eat Pray Love traveled to in search of enlightenment (Ubut – Eat Pray Love). Maybe this accounts for the fact that so many are seen wandering the streets of Ubud in a yoga-get up, complete with baggy pants, white tops and beaded necklaces. I don’t know, but I suspect a connection. Also, the town is filled with tourist souvenirs, such as t-shirts, posters, etc, with statements calling for world peace, touting organic foods, and describing Bali as a place fostering Human Rights and freedoms. This seemed hypocritical when the souvenirs hung from tiny shed-shops on a street strewn with rubbish, where there are drains in the middle of the street, where you could look down into said drain and see a shoe or disposed plastic bottles. I don’t know but I can’t say I saw much in the way of a magical, spiritual land filled with enlightenment and healing. I saw a developing country, a beautiful one, but not the mecca of wellness and health that many appear to believe it to be. Here is a post from The American Girl, which describes it better. In saying that however, I have nothing against Bali or Ubud, or the lovely, hospitable and smiling locals. I just don’t understand the tourists that flock to Ubud and gobble down this whole yoga-world peace-organic living idea there. Excited to be on the way! On the bottom right hand corner is the priest – before the performance he had to do a small prayer and sprinkle holy water on the instruments and the stage. In the picture at the top is the dancer dressed up as, and playing the role of, Hanuman, the Hindu Monkey-King. The majority of the population in Bali are Hindu but even though I am also from a Hindu background I found that there were very few similarities in the practices, rituals and traditions. 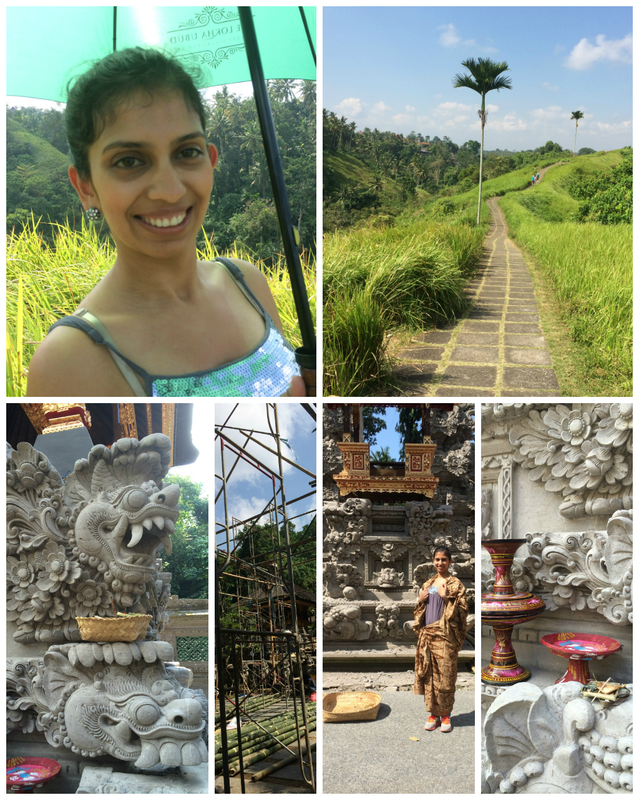 Our first adventure down to Ubud town. Our hotel, the Lokha Ubud, was situated in the village of Keliki and was around a 20-30 minute walk from Ubud town. The path wound through the Campuhan Ridge Walk, which was amazing and very scenic. 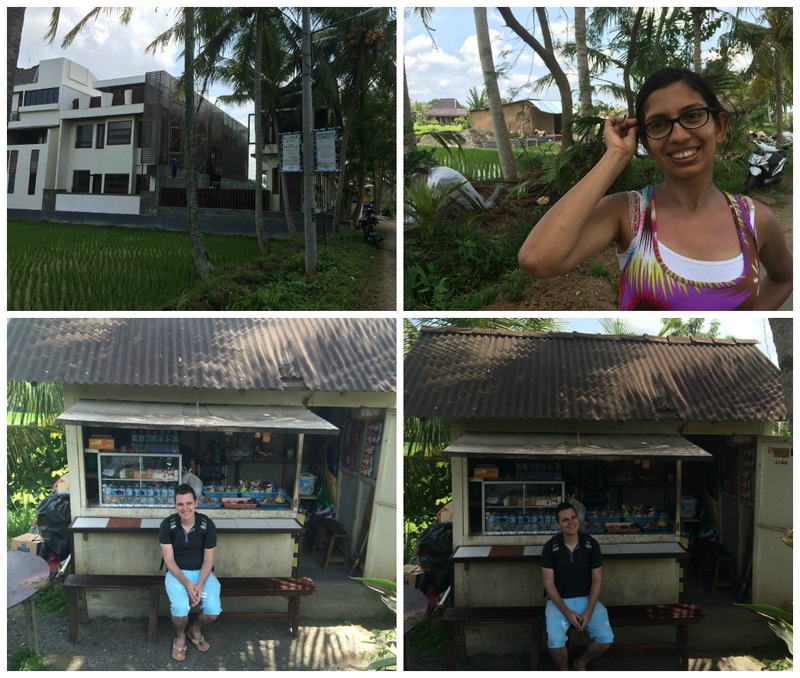 We were pretty hot and sticky by the end so we stopped at a cafe – Murni’s Warung – for some nice tea and a short rest. 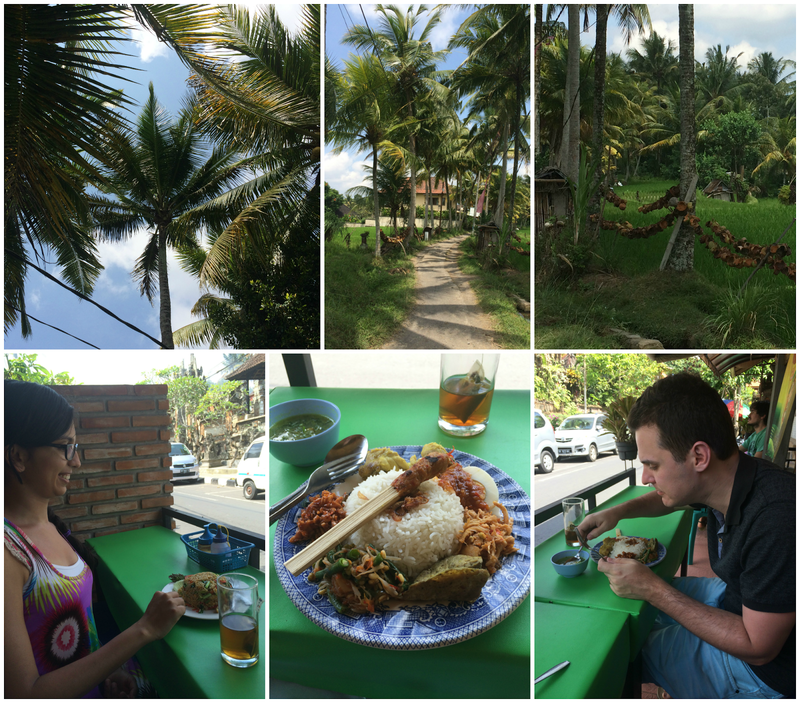 At the end of the walk around Ubud town, we were pretty hungry and tired. We enjoyed a nice refreshing coconut, some curry/soup and then time to start the next day full of energy and adventurous spirit! 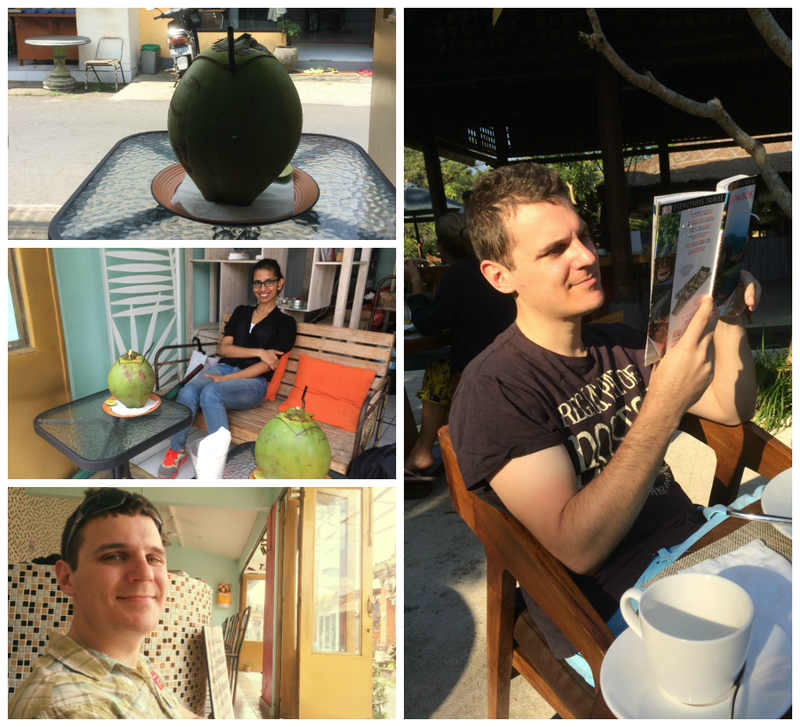 (there is Max back at the hotel the next day having b’fast and checking our guidebook). 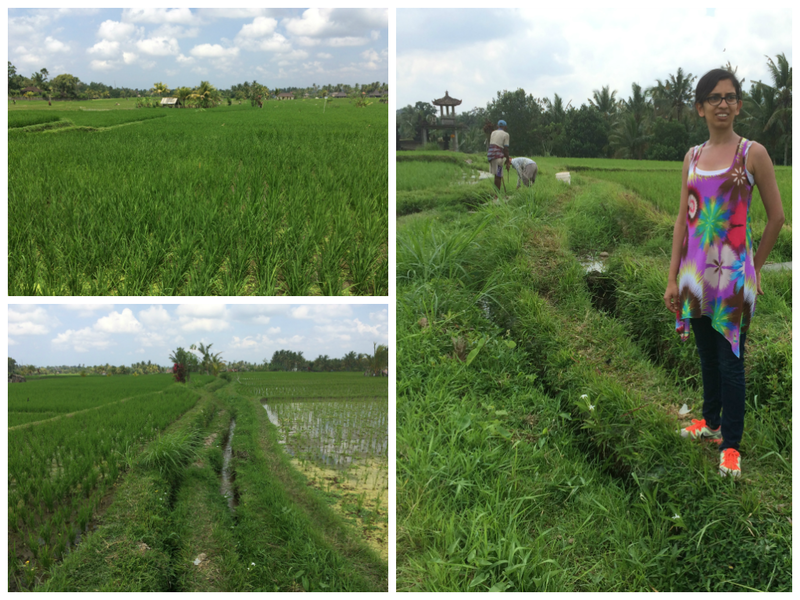 The next day, we set out for an exploration of Ubud’s rice fields – on the rice field walk. It started off all well and good, but after following the path through the rice fields for a while, I noticed that we were now the lone tourists travelling the path. We had missed a turn somewhere and ended up lost! We continued walking ahead but eventually came to a place with a house on one side, and a madly barking dog, and a cliff to the other side with a narrow strip of ‘path’. I wasn’t quite ready to believe that that was the right path, or that it was meant to be walked on (with the danger of falling off the cliff!) so after some persuading Max agreed to turn back. Thankfully, we met a lady on a motorbike as we were tracing our steps back, and she told us that the house we had seen (the house whose backyard we had been in!) was hers, and she even invited us to her house, which we politely declined. She pointed us in the direction of Ubud town and after asking more people along the way for Ubud (no English meant that we only pointed and said “Ubud” to ask for directions haha), and after 5 hours of walking through a village, we finally saw tourists again and knew we had arrived back in Ubud town. On our way through the village, we came across a small and some-what-forgotten temple with an old lady standing outside. We went inside and the lady dressed us up in the traditional temple wear. She then very proudly showed us around the small temple and took pictures for us. She looked very poor and it was evident that not many lost tourists wandered this way to her temple so we decided to give her a generous tip and left her content. 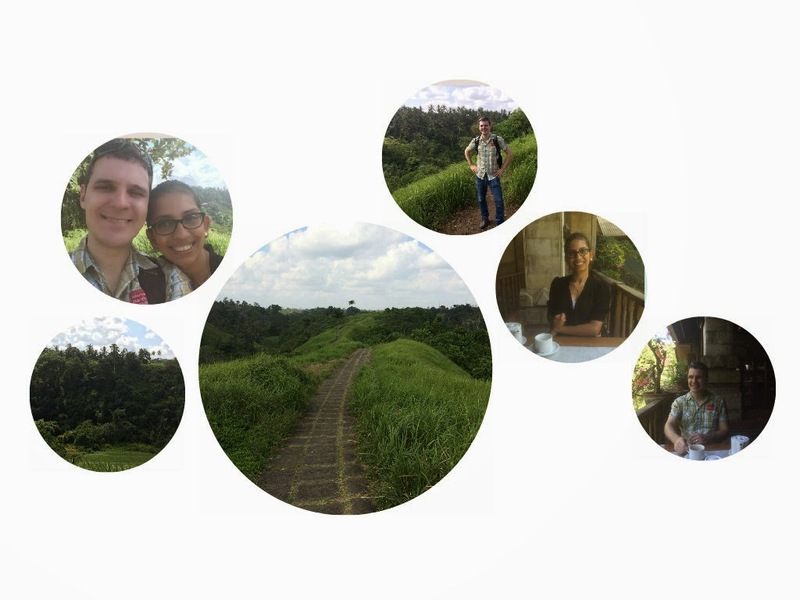 Below you can see pictures of our adventures through the rice fields, and from the temple. 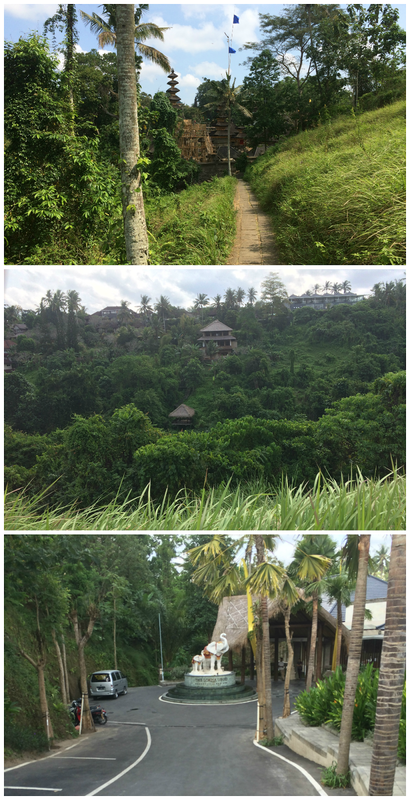 The top pics are from the Campuhan Ridge Walk, which we had to go through each time to get from our hotel to Ubud town. At the end of the walk, there is a large temple that was always busy with lots of construction going on – there were men cleaning and preparing bamboo poles (you can see their construction in the picture above) and women carrying huge bowls filled with stones and earth on their heads, and the older ladies preparing food. You can also see there my attempt to dress up with the traditional clothes in order to enter the temple – quite a failure haha! 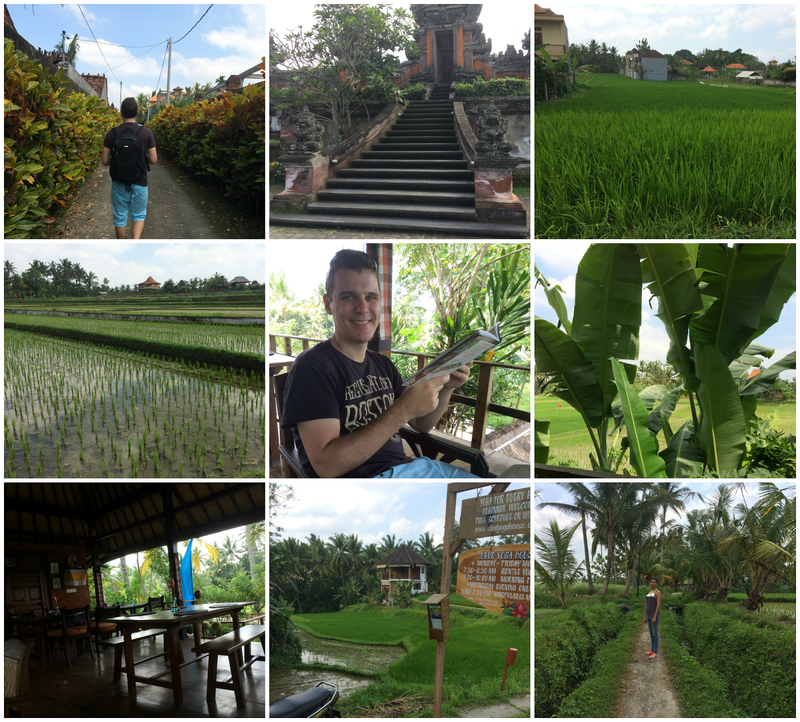 Top left: Max walking on the path he thought would lead us to the rice fields walk. Second picture at the top: this is where the path actually led us – to someone’s house. We did not know it was a private house so we peeked around from the gates. 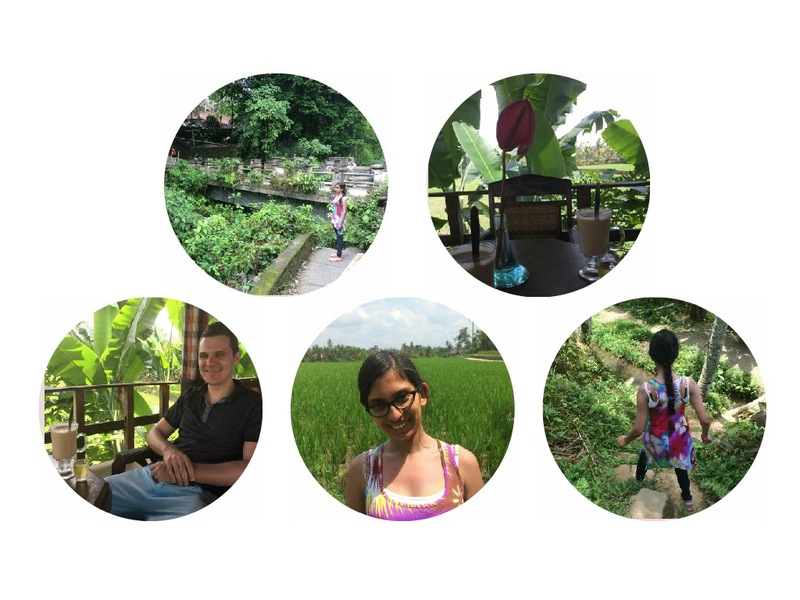 Top right: yay, we finally found the rice fields! And wow, so lush and green. Bottom row: rows upon rows of rice. Because Ubud is mountainous, I read that the rice farming has to be done manually as it is too difficult to bring machinery there. We saw many farmers busy tending to the rice. We decided to take a break and enjoyed some nice tea at a very nice cafe – it was right in the middle of the walk and was so nicely set out, all open and breezy, and looking out into the rice fields. Bottom row: that was the Ubud Yoga House – looked like an awesome place to practice yoga but unfortunately I did not get a chance to try it out. After the long adventure, we were both tired and decided to take the next day slow. I really wanted to go on an Elephant Safari as I had never had the chance to ride an elephant before so we decided to spend the day doing that. 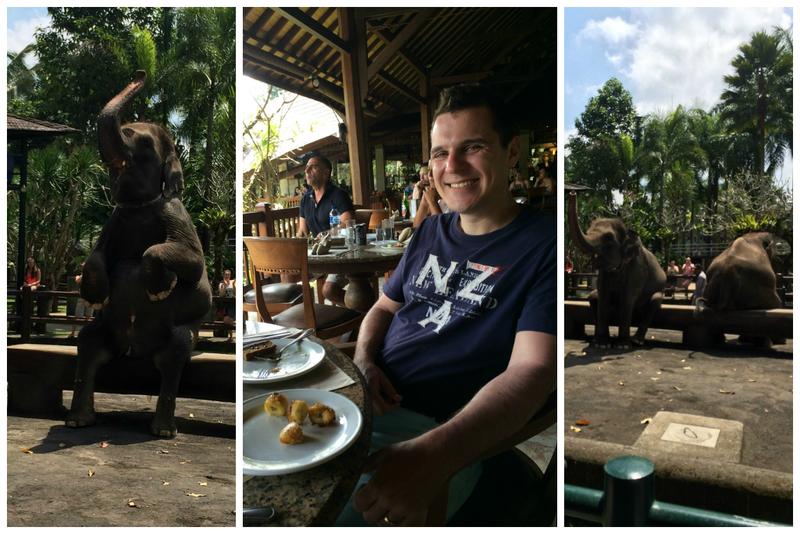 We booked for a tour at Elephant Safari Park, Taro, Ubud. I was looking forward to seeing the park and the elephants as it had Sumatran elephants, which were endangered and supposedly they were very well looked after at the park (this really did seem true during our visit there). 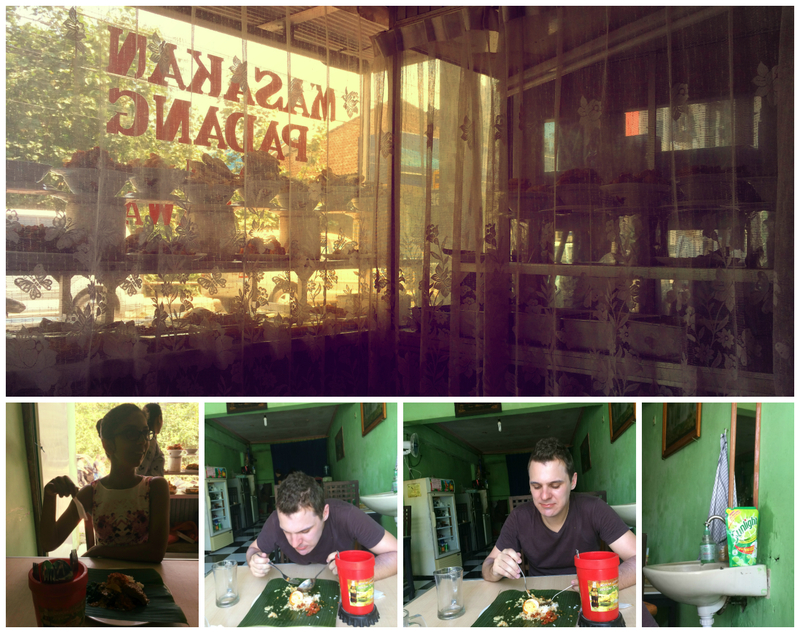 It was quite pricey though, at approximately $80 USD per person (we booked through Bali Adventure Tours). During the elephant ride, I was scared that my jandals would fall off so I took them off and I could feel the elephant’s skin and fine hair under my bare feet. Their skin was very nice, a bit hard, but the hair felt really soft and fluffy. Our elephant also liked to munch on some leaves and plants along the way, and towards the end, she almost ran towards the bamboo branches left on the floor for the elephants! A very hungry elephant indeed. The mahout told us that the elephants liked to eat bunches of banana the best (and not just one banana but the whole bunch at once!). Apparently, the farmers who owned the neighbouring farms with the banana trees on it did not like this and charged something equivalent to $5 USD for each bunch of bananas that the elephant ate haha (this was a large amount for the mahout to pay). Included in our ticket was also a buffet lunch at the restaurant – it was good, but didn’t compare up to the extra yummy standards of the normal fare we found in Ubud town. 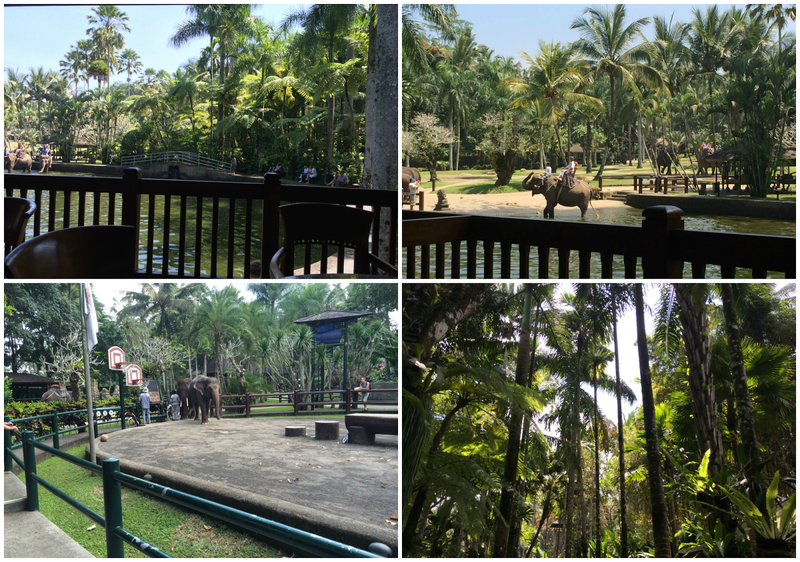 While we had our lunch, we could look out at a pond where the elephants all had to go through towards the end of the ride – they didn’t seem to like it and the younger elephants had to be trained to go into there by repeating it over and over again. 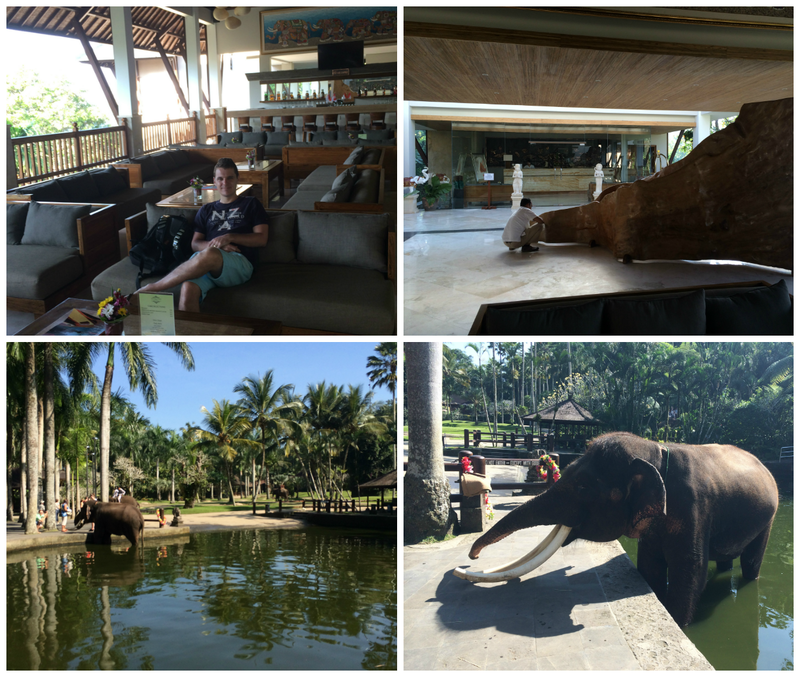 Top left: Max sitting at the hotel lounge at around 8am waiting for our transport to the Elephant Safari Park. Top right: while we waiting for our transport, we saw this one guy very busily cleaning a huge piece of wood (?) in the lounge, with all his attention. 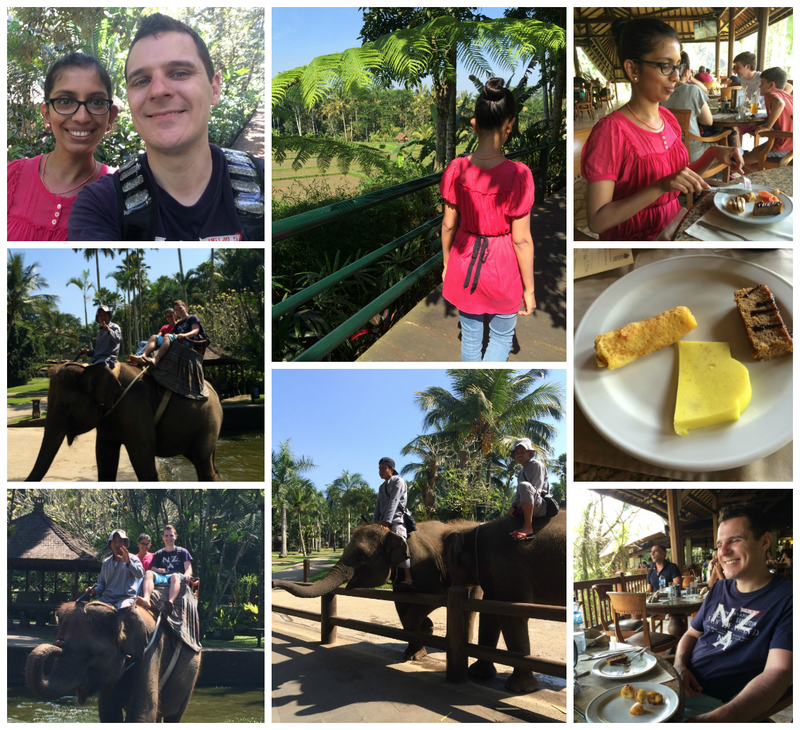 Bottom row – the elephants! 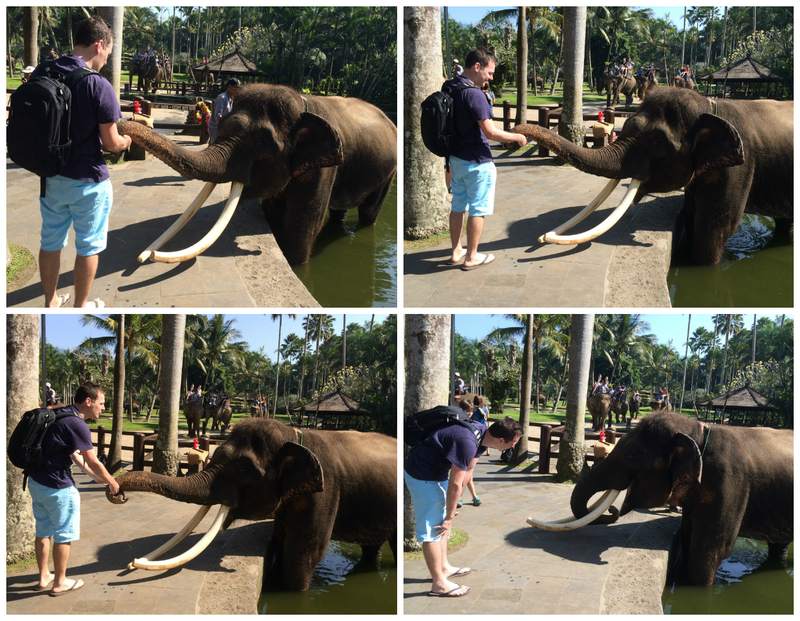 Max feeding the elephant. They ate bamboo and when they ate it it made this really cool sound getting crushed! At the end of the day, we were (unexpectedly) very tired – actually, now that I remember it, I recall that on the drive back from the Elephant Safari, the other couple were sleeping and even our driver started dozing off from time to time (scaring me very much!). Even so, we were hungry and decided to venture down to Ubud town after returning to the hotel, but it was getting dark so we went to the first Warung that we found, that looked reasonable. It was at someone’s house, and although the food was not great it did give us a chance to look inside the compounds of the house. There were many shrines and the smell of incense. I forget to mention, in Ubud it seems that the locals and shop owners put out some offering of food and flowers out into the streets daily and they also do little prayers throughout the day (each shop appeared to have a small shrine it it or nearby). Afterwards, we were still a little hungry so we ended up going back to our favourite Padang restaurant on the main road for a second dinner hahaha. This left us quite full and as it was getting dark opted for a taxi back to the hotel. Good thing too, because when we told the taxi driver about our dilemma in not being able to find many good restaurants that had local food in Ubud town, he told us that is because the locals don’t tend to eat much there. Aparently, they go elsewhere to eat. We prodded him a bit about this and he eventually gave us some suggestions. A lot of the places were too difficult to get to (and we had little time left in Ubud) but a place by the name of Gianyar sounded promising. The taxi driver agreed to take us there the following day, and take us around, wait for us and then drive us back to the hotel for approximately $30 NZD. The Gianyar night market was definitely worth the trip and money. It was filled with tiny stalls selling all different things – all kinds of food, snacks, desserts, shoes, clothes, accessories, drinks. And many, many locals. We only saw a handful of Westerners there. We were a bit worried about eating street food – our number one rule when travelling in the past was never to eat street food. But the food here was irresistible. We tried fish kebab, yum yum! It was minced fish with spices and sauce. We tried tempura (or something like it), made from fermented casava, tofu, among other things. We tried steamed fish that had been cooked in banana leaves, each one wrapped individually. We tried fermented rice desserts. And all with our hands! After trying out some various kinds of foods, we decided to settle on having goat curry/soup for dinner (our taxi driver/guide seemed to favour this dish!). It was yummy and we were very satisfied after all the delicious foods and snacks – and all for very, very cheap prices. Our guide very proudly showed us around and even took extra care to help us navigate the busy streets when crossing, he showed us pictures of his family, ordered food for us (yeah, they did not have any signs, menus and there was generally no way of knowing how a food was to be eaten if you were not Balinese) and got worked up when one of the ladies tried charging higher rates as we were clearly tourists. Definitely an experience. Here is a bit of an old post I found from The Jakarta Post, but it sums up the Gianyar Night Market well. During the day, we decided to make another try at the Rice Field walk, and this time Maxi was certain he knew the loop that we had to take to return back instead of walking ahead for kilometers again. Well, it started off well. The top left photo is at the end of the Campuhuan Ridge Walk, which had the super busy temple to the left of the photo (just outside the photo). The next photo is of some delicious Chai Tea we had, with spices, milk and sweet syrup at the cafe on the Rice Field walk. There’s Max on the bottom left with his Chai tea. 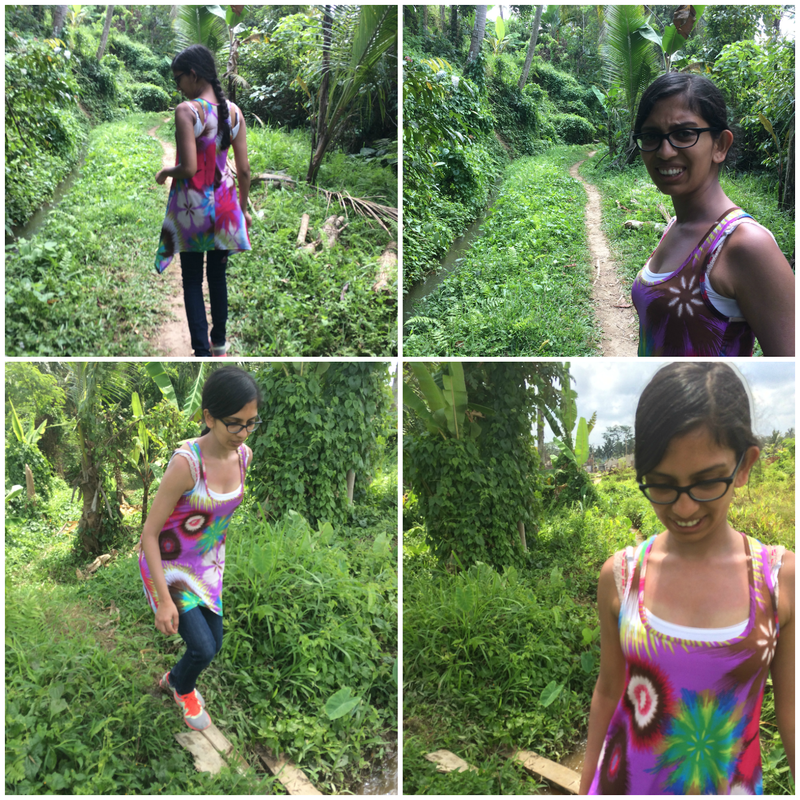 We then continued our walk through the rice fields and at the bottom right corner you can see me going down a ‘turn that leads to the loop back’ – according to Maxi. Although we found it just led to a forest! This is the so called path, which led to the forest you can see above. A not very happy me! We ended up climbing up the slope to the left in the pictures and when we got to the top we were greeted with…..
We found civilization again! Yay, the path! There’s Maxi waiting for his tea at a little shop just after we found the path back to the rice fields. The lady who owned the shop did not have running water so I saw she used water from a huge gallon, which she poured into the pot and boiled it for tea. While we were there a really old man also came by, sat down and had a coffee. It was a nice, authentic experience. Photos from our way back to the hotel and lunch at our favourite place-without-a-kitchen-by-the-busy-street-opposite-the-temple! Ah, the night market! In the middle row is our taxi-driver-night-market-guide! As you can see, he was pretty happy and in his element here 🙂 My brave Maxi tried every dish offered to him! And his tummy wasn’t even upset the next day. 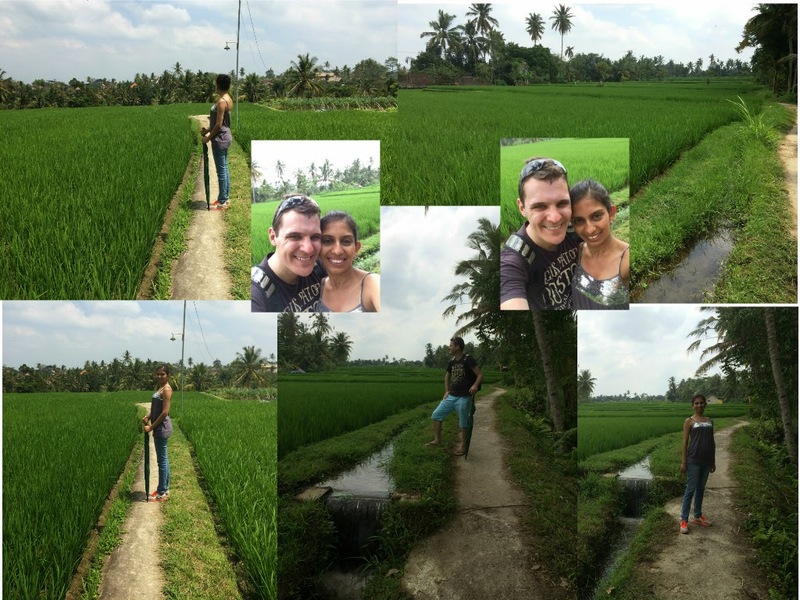 After all the excitement of our walk in the rice fields (and through the rice paddies! 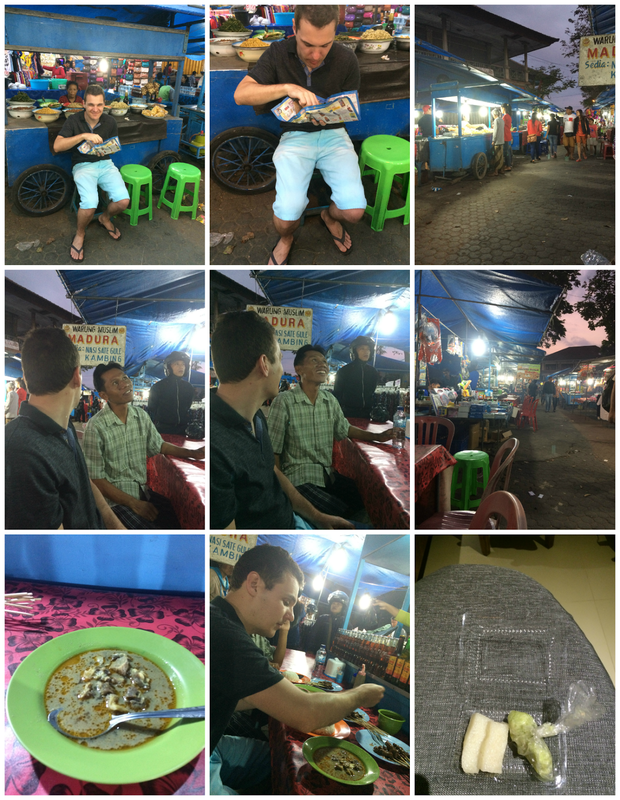 ), and the visit to the Gianyar night market, we decided to have a quiet day on the 30th of August. We went to the Karsa Spa, which was located just a few minutes from our hotel, on the Campuhan Ridge walk. They’ve set it up very well, with beautiful rice paddocks, and nice gardens. The massage itself was relaxing but not a deep tissue massage as I had expected. But for the price, definitely worth it. The bottom left photo is from inside the spa, in the couple’s room. We each had a 60minute deep tissue massage for Rp 160,000 each (that was a bit pricey compared to the massages you could get in Ubud town but we chose the Karsa Spa because of its convenient location and pretty setting). 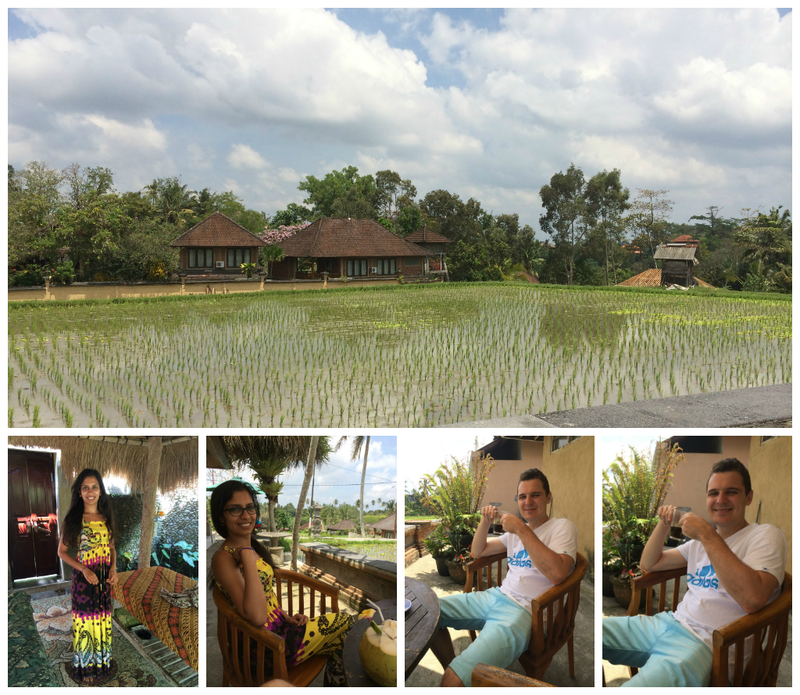 After the spa, we sat at a little cafe overlooking a rice paddock (in the photo above), where I enjoyed a young coconut and Maxi had a Balinese coffee. We then decided to have a quite dinner at the hotel (our legs were a bit sore from all the wondering around during the day so we weren’t ready to take the walk down to Ubud town for dinner!) Unfortunately, the dinner that we had – pizzas (Maxi’s pizza had raw egg on the top – like actually raw, as in the egg white was still clear and runny) at the hotel restaurant left much to be desired but we two tired travellers decided to call it a day and headed for an early night’s sleep. Although the dinner wasn’t good, we couldn’t fault the service. Maxi had mosquitoes biting him so one of the staff came and sprayed some insect repellent on both of us; and the setting was also lovely. Hidden away just above the Wos river and surrounded by lush green trees. 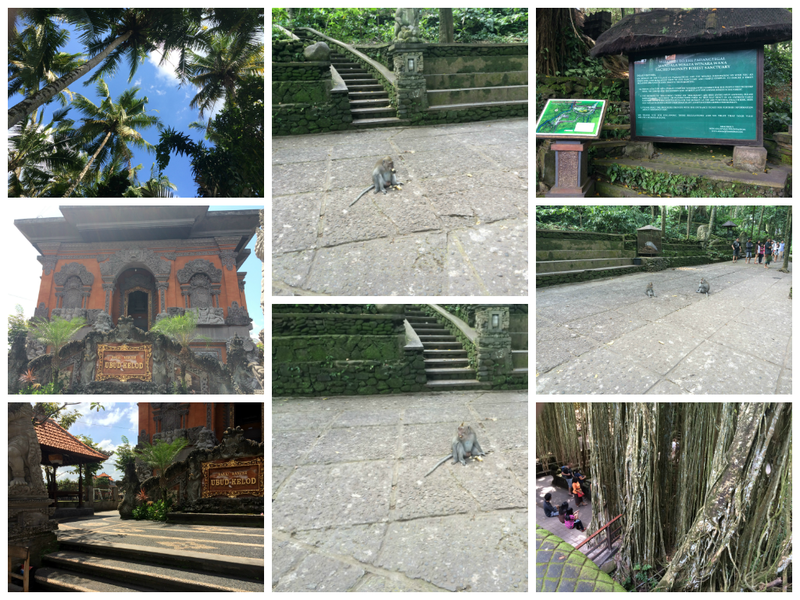 In our last days in Ubud, we went to visit the Monkey Forest. The monkeys were smaller than I had expected but there were many, many more than I had thought! They were everywhere and did not seem to mind the humans walking around in their forest. A few of them were up to lots of mischief, seeking bananas and food from the humans, or having little fights amongst themselves. One monkey in particular I remember – there was a guy sitting down on the steps and a monkey sitting next to him. He starts talking to the monkey and the monkey gets really close to him, to get the food from him. He monkey starts getting a bit aggressive. One of the men patrolling the forest tells the guy to stand up because “the monkey is too big for you”. So the guy stands up and the monkey doesn’t get his food. The monkey then gets really angry, runs to the man on patrol (who had effectively stopped the monkey from getting his food!) and starts clawing at the man’s pants. The man scares him away with his torch/stick. There were other monkeys, some trying to open empty Coca Cola bottles, another one trying to crack open a coconut by throwing it on the ground again and again, and another way playing with 2 small pebbles. It was amazing how smart and human like they were. But I was also scared of all those monkeys running wild around us (although truth be told we were not in any danger haha). 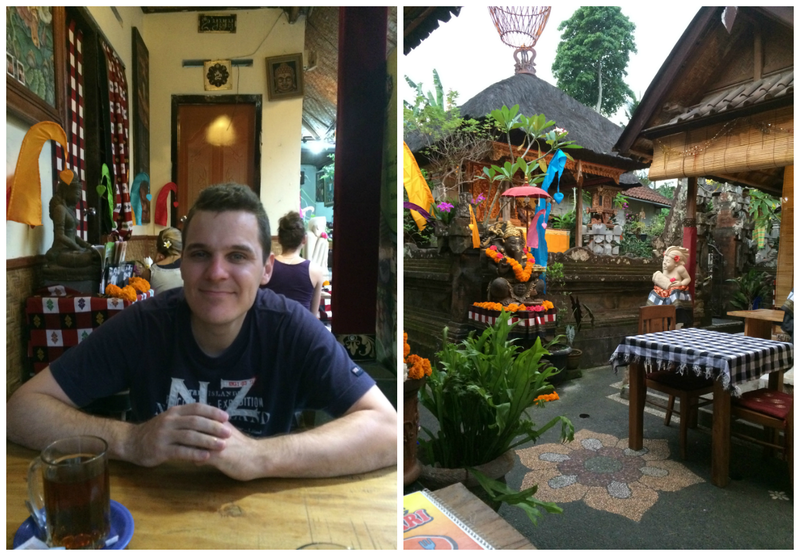 We really loved eating at Puteri Minang, our favourite Padang food restaurant in Ubud (it is located on the main road, next to a Ganesha bookstore). 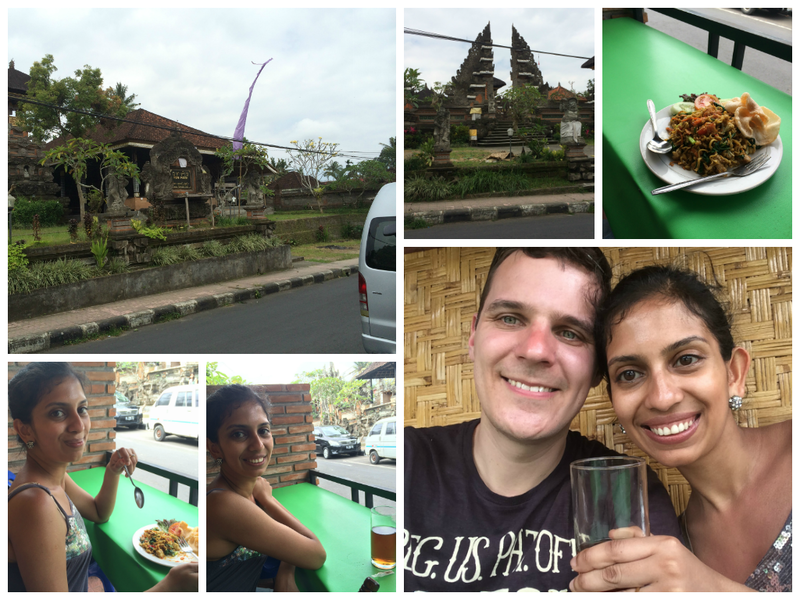 Unfortunately, on our last day in Ubud town, that restaurant was closed/getting renovated! We were gutted!!! But after a little bit of walking, we came to another Padang restaurant (pictured above), which was just as local as Puteri Minang, though the food wasn’t as nice. We had this delicious spicy boiled egg, rice, sambal chillies, some chicken sauce and beef rendang. We ended up having 3 servings between the two of us. As you can see in the photographs, the place was definitely not geared for tourists and a sure sign of this is the little hand basin and handwash next to the tables, which the locals use for washing their hand after eating. While we ate, the owner also came and took a few things out of the fridge at the back of the restaurant (you can see the back part, with the fridge and other things in the back behind Maxi in the photographs). She was obviously busy cooking or preparing food and a younger woman sat in the back peeling onions and garlic. The owner was so happy when we ordered the third dish and more tea hehe! Thanks guys, my wife and i will be staying for 8 days at the end of May 2015 and your insights are very useful.